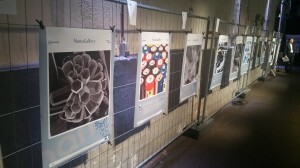 The NanoGallery, an exhibition of images at the nanoscale, was on display during NanoCity, the major Dutch nanotechnology conference, at De Fabrique in Utrecht on 27-28 October 2014. The NanoGallery connects micrographs – images at the nanoscale – with pictures of the real life applications in which these materials are used. The NanoGallery is a NanoDiode initiative developed by the NanoNet Foundation in Poland, where it was first on display. After The Netherlands, the NanoGallery will continue on its tour through Europe. Its next stop is Germany.